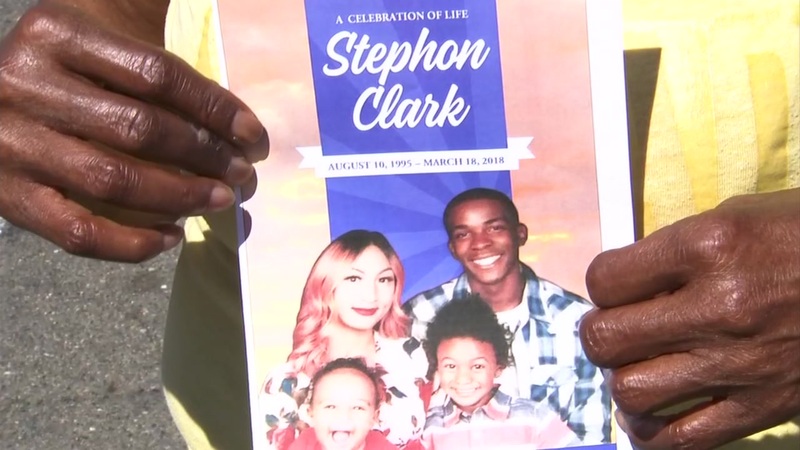 SACRAMENTO (KGO) -- It was a somber and emotional day in Sacramento, where family held a wake for Stephon Clark, the 22-year-old unarmed man shot and killed by Sacramento police ten days ago. It comes one day before the young man's funeral. "Woo, I never thought in a million years that it would happen in Sacramento," said Pamela Audrick as she emerged, wiping away tears, from the wake. "This is a little too much for me...too much. I know that hurt that mother and grandmother are going through. I lost one." Sacramento police claim Clark's shooting came at the end of a foot pursuit on March 18th and that he was a suspect in several car break-ins. And while officers apparently thought Clark had a gun when he was cornered in his grandmother's backyard, it was just a cell phone. "His life can never come back,' said Cynthia Brown, who told us she knows Clark's grandfather. "His Grandma...the last place he lay, instead of in the house in the bed, on the background...dead." The grandmother of an unarmed black man killed by Sacramento police is calling for changes in the way police confront suspects. She suggests shooting them in an extremity. On Tuesday night, Clark's brother and other protestors disrupted a community meeting held by the city council. "This is one of the most horrific incidents of police shootings that's occurred anywhere around the country," said Sacramento NAACP board member Joe Debbs, who also commended Sacramento's police chief Daniel Hahn for releasing both aerial and cell phone video of the shooting and what led up to it. "He has changed the world. This is it," said Kimmy Simone, who told us she is Clark's aunt. Kimmy Simone told us she is Clark's aunt. "This baby right here, good child. He's a good child. He wasn't a bad person at all. He did not deserve this. I'm going to say it again. He did not deserve it." Clark's funeral is set for Thursday morning. The Rev. Al Sharpton is expected to speak at the service. Click here for full coverage on the shooting death of Stephon Clark.